Today I found out a man once tried to raise his son as a native speaker in Klingon. The man in question is computational linguist Dr. d’Armond Speers. Speers is actually not a huge Start Trek fan himself. Indeed, many Klingon language enthusiasts aren’t, contrary to popular perception. They tend to be language lovers fascinated by constructed languages, of which Klingon is a relatively thriving one, hence why they gravitate towards it. Speers became fascinated with the Klingon language after reading a flyer on a bulletin board at Georgetown where he was studying linguistics. The flyer was advertising the Klingon Language Institute (KLI), founded by Dr. Larence M. Schoen. “I thought to myself, ‘A new language.’ The fact that it was a constructed language really appealed to me. It sounded like fun,” said Speers. In any event, unlike his wife, Speers almost exclusively spoke to Alec in Klingon. He even would sing the Klingon Imperial Anthem, May the Empire Endure, as a bedtime lullaby to the boy, which his son soon picked up and would also sing. You can hear a recording of Alec singing this here. This experiment went on for about three years, during which time, as you might imagine, Speers was given a lot of funny looks in public as he’d converse with Alec. At first when people would ask what language he was speaking, Speers would respond, “speaking Klingon”, but after getting a lot of dirty looks and comments for this, he switched to just saying, “speaking a constructed language”, which generally would forestall potential negative remarks. Today the teenage Alec no longer is fluent in Klingon and reportedly can’t even pick out the meaning of individual words of the language. The first Klingon word Alec picked up was “HIVje”, meaning “vessel”, which is the closest approximation to “bottle” the Klingon language had at the time, so what Speers used. He also quickly learned “vavoy”, which means “daddy” and was one of the few Klingon words Alec would commonly choose to speak, though of course he began to understand the language quite well. It is estimated that approximately 20-30 people in the world, including Speers, are fluent speakers of Klingon, with another few thousand that are familiar enough that they can pick out words when they hear it spoken. Every year Okrand is given a “wishlist” for new Klingon words to come up with, and when he does so, they are published in the HolQeD (Language Science). Okrand himself has published The Klingon Way: A Warrior’s Guide with such riveting tails as “Revenge is a dish best served cold.” He also has put out a best selling audio instructional Conversational Klingon, as well as Power Klingon (“Learn Klingon Jokes, insults, and toasts”. KLI currently has about 2500 members in 50 countries throughout the world. Among other things, KLI publishes poetry and fiction in Klingon and hosts a 5 day conference every year called the qep’a’ (“Great Meeting”), open to anyone who wants to attend, whether member or not. They are currently attempting to translate the Bible into Klingon and are also working on translating various works by Shakespeare, to which they’ve already translated Hamlet. During the qep’a’ a $500 scholarship is awarded to a college level linguistics student. The official motto of KLI is qo’mey poSmoH Hol (Language Opens Worlds). 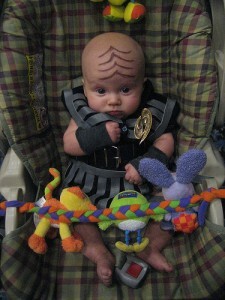 Every child should have a Klingon name. I met two Klingon officers from a Warbird squadron and they gave me the name (can’t spell it) Nisssjhu. The emphasis is on the JHU syllable. I wanted a strong name. It is a derivative of Sin. I wonder if getting alex to watch the shows might have made him more interested in the language? What a jerk … instead, he could have taught the boy something actually useful like Chinese, Japanese, Spanish or any language that applies to actual Humans. The goal was not to teach a foreign language, but to study acquisition of a constructed language. It’s funny how judgemental people here are. Though personally, I’d chose one that has more varied vocabulary and is not so difficult to pronounce for a small child. When your father is an idiot. Yes, why not teach him a useful language instead of something that wholly serves your own ego? He clearly is the opposite of an idiot. If anything, more such experiments with constructed languages should be done to learn more about how human brains acquire and internalise language. I seem to recall reading more about this, that he had trouble in general because Klingon Hol simply isn’t written with kids in mind, has a really limited vocabulary, and is largely about things most people who aren’t warriors traveling on a ship wouldn’t use very often. What I wanna know is A) did he continue calling him vavoy? because usually the name you learn for your parents is their NAME to you.. even if kids do generally shorten daddy to dad over time.. and B) how did he learn it well enough to speak it fluently enough for conversations not to be stilted as heck? I know linguists tend to be those kinds of people who are good at learning languages, but.. really? so good at it that you’re always ready all the time, when talking to your kid?